As I grew increasingly bored by the sweets on offer in usual venues (convenience stores, supermarkets, snack shops) in Tokyo, I started to look further afield for interesting items. During my last year in Japan, I happened to work near not one, not two, but three shops specializing in regional sweets. One of them sold items from Hokkaido, including the Guarana soda I reviewed previously. It was at that very shop (in Shinjuku, near the Southern Terrace exit), I found this little bit of candy for 50 yen (about 60 cents). I like old-fashioned packaging, and often was drawn to candy merely by such packaging. Unfortunately, what lured the foreign snack review blogger didn't necessarily draw in the jaded locals, who often saw such candy as something their parents or grandparents ate. Let's face it, this is not the sort of thing that people are going to be loudly shouting about in television commercials. It's far more likely to be welded to the bottom of your granny's pocketbook after being forgotten over a hot summer. The company that makes this is called Kibidango and they make a relatively small range of traditional treats. I reviewed their "millet dumpling" awhile back with limited enthusiasm. They make the sort of stuff that most foreigners would shun based on the inability to determine what is inside. Even if you bought it based on the packaging, it might scare you away once you saw what was inside. 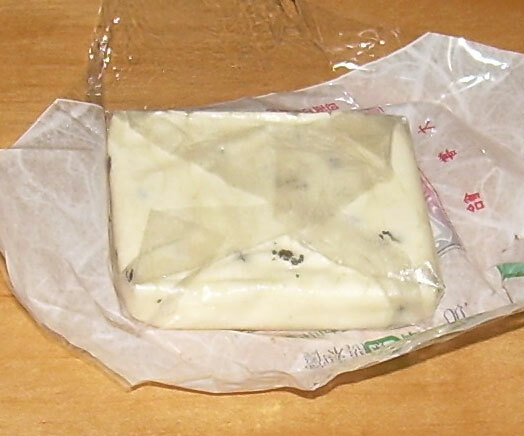 Let's face it, this looks like it may have gone moldy with the little black specks embedded in the whiteness. Inside the wrapper is a flat little block (18 grams or about half an ounce) covered in oblaat, an edible wrapper which is similar to the types of coatings on (medicinal) capsules. The ingredients list is very short and is only malt syrup, sugar, sesame, and oblaat. The little slab is rather tough and hard to bite into. It's like taffy or hard nougat that you have to fight free from the larger piece in order to take a bite of it. Think of yourself like a dog that is trying to wrest the rag free from your master's hands as you attempt to tear off a bit. After you manage to bite off a piece, it'll slowly become more pliable and taffy-like in your mouth. It'll stick to your teeth like nobody's business and threaten to rip out your fillings. The question is, is it worth the chewing? The answer is a less than resounding, "yes". The reward is a very nicely flavored bit of black sesame taffy which is has a good, but not cloying or overbearing sweetness. Mind you, I recommend only eating about half of the small portion at once as the sweetness does build up as you eat more. However, I did like the flavor of this quite a lot, but I didn't care for the texture much at all, especially in terms of trying to tear a bit free of the entire smallish piece. I'd say this is worth a try if you like taffy and have good, strong teeth. This gets a "happy" rating, but only barely. I knew that there were going to be options for some of my favorite Japanese snacks in America. One of the things that I had high hopes for was a tasty Americanized version of sembei or rice crackers. When I checked Amazon, there were quite a few versions of them sold packaged for the American market. Note that they aren't necessarily made in the U.S. These were made in China, which actually was sometimes the case for the snacks I had in Japan as well. Just because Japanese writing is on a package, it doesn't mean it was made in Japan. Many of the things I purchased were made in Taiwan, Korea, Vietnam, or China. This is because Japanese manufacturers take advantage of the same reduced labor costs as American companies do. In fact, one little tidbit of information that many people who live in Japan don't realize is that there is a reason there is so much Aussie beef in Japan is that the cattle farms are owned by Japanese business people. Of course, it is still good for the Australian economy to have the farms in their country, but it doesn't represent the sort of opening of the domestic market that many people believe it does. The Japanese only allow copious imports from a country when they have a vested interest. Otherwise, it's rumors about pesticides and heavy restrictions. I'm not sure if that's the way it is in every country around the world, though frankly, it wouldn't surprise me if it happened like that to some extent everywhere. And these were made for a company in California so, that's a little support for my assertion right there. Getting to the snack at hand, I've got a lot of options for rice-based crackers to sample here in the U.S. Even in the little markets I have access to at present on the San Juan Islands, there are a minimum of 6 varieties. Most of them, however, are all the same flavor, sesame. There's nothing wrong at all with sesame. I love it, after all, but I'm going to get pretty wistful for the wasabi, yuzu koshoo, and kinako crackers I could get in Japan if my selection doesn't widen when I leave here in about a month. I found these crackers at a tiny little market on the South side of the island I'm on. It happens to be the second of only two markets on this one. I bought these at that place for two reasons. The primary one was that this little market had an interesting and eclectic blend of items from all over the world and their business wasn't exactly booming. I wanted to support them by spending my money with them rather than the bigger chain market on the other side of the island. The other reason was that they were pretty reasonably priced at $1.89 (153 yen) for a 3.5 oz. (100 gram) bag. It's nice to support the little guy when it costs less than supporting the big guy. Since I doubt my readers will be in the San Juan Islands, I'll mention that you can get them from Amazon, but I'd be surprised if markets all over the U.S. don't carry them. 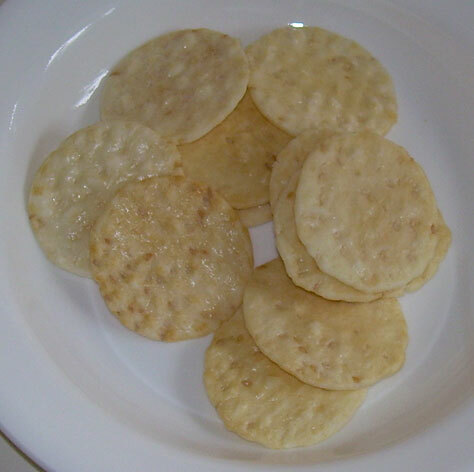 These crackers don't smell like much of anything though they do have the vaguely rice crackery smell. They do have that same baked rice flavor that I associated with rice crackers in Japan, and there is a pleasant sesame seed flavor, but it's the flavor that you get on the top of your hamburger bun. That's because these are made with white sesame seeds, not the black ones that are more common in Japan. Since they are mildly salty, the delicate sesame flavor is able to shine through. The point on which these really fell short for me was the texture. They are hard and slightly tough. I'd wager this is because they are baked rather than fried and contain less oil than Japanese sembei. While the bag does not say anything about how these are made, the fact that 18 crackers have only 120 calories speaks volumes. Each cracker is 2 inches/5 cm. in diameter, so they aren't exactly tiny. The ingredients list is also quite short with rice, white sesame seeds, sunflower oil, and maltodextrin as the main ingredients and less than 2% sea salt, sugar, and kelp extract. I don't know if that actually makes them "healthy", but it doesn't look too bad. I wouldn't buy these to just eat by themselves because I've been spoiled by the light, crispy texture that comes from Japanese "hard" sembei (their way of referring to deep-fried, crispy, thin rice crackers). However, they do make a good cracker to accompany cheese, dips, etc. I also think that other people may be a bit less fussy about the slight toughness of the texture than me. Eating these makes me appreciate more than before the delicate balance between the taste and texture of a product and the "healthiness" of it. These are definitely lower calorie than Japanese rice crackers and have a nice flavor, but they aren't quite as much fun as the less healthy and stronger tasting rice crackers I could get in Tokyo. Still, I'd buy them again. It's that time of year in Japan again. The cherry blossoms are blooming. The salary men are sitting on blue plastic tarps and getting drunk in appreciation, and the young folks are flocking to Inokashira Park in Kichijoji and drinking in reasonable moderation. The vendors near that area, which has very heavy foot traffic composed largely of people for whom nutrition is not a concern as there are a lot of university students, always come out in force to sell their wares. I'm sure most people imagine Japan at cherry blossom season like some ukiyoe (woodblock) print and food options would be more like bean jam buns (anpan) and dango (mochi balls on sticks). The most popular thing, at least by the number of vendors, is wieners on sticks and whatever Western food strikes people's fancy in a given year. 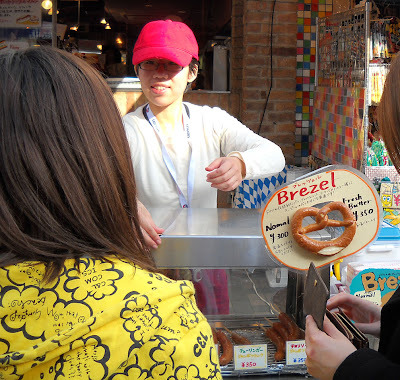 This charming woman is selling chorizo and Bavarian pretzels in "normal" or "fresh butter" flavors. During the early days of our time in Japan, my husband would see "chorizo", which he loves, and eagerly buy one. That eagerness was quickly suffocated by the fact that "chorizo" in Japan seems to mean "marginally spicy hotdog". I'm guessing the Bavarian pretzels (Brezel) were about as authentic as the chorizo. Prolific movie reviewer Roger Ebert once said something to the effect that what he wanted out of a movie was for it to be something that he had not seen before. Given how many movies he digested as a movie reviewer, this would become an increasingly difficult bill to fill. The more active experience you have with something, the harder it becomes for the next experience to impress you. Note that I say "active" experience and not "experience". Most of us sleepwalk through our sensory lives. We wake up and barely taste the expensive coffee we pick up at the local coffee chain shop. Well, when I say, "we", I mean other people. I make an active effort to attend to the taste, smell, and texture of every food I consume. This is the gift and curse of being a food blogger, as I'm sure Roger Ebert can't watch a movie without attending to various details that most of us pedestrian viewers fail to notice (and therefore can just enjoy our movie without any extraneous nonsense). In no way am I suggesting that my sense of taste is refined from attending to all that I eat, but rather that it becomes pretty jaded. Things that people who are not food reviewers enjoy will be those which I find lacking because I'm paying perhaps too much attention. One of the reasons that foodies, and I'm not a "foodie", but more of a "junk foodie", seek food further and further afield of their usual scope is that they're bored. They start to think that "different" is "better" because this is valuable to them personally, just as Roger Ebert embraced and endorsed movies which I found unappealing because, for him, "different" was "better". That's a big intro for a review of the Japanese equivalent of Tic-Tacs, but I'm making a point about all Japanese food and snacks. These are awesome in part because they aren't the little smooth pellets that shook in ones pocket throughout childhood, though they do essentially fill the same niche. The main difference is that Mintia plays into the higher Japanese tolerance for sour things and a mixture of savory and sweet together. Tic-Tacs play closer to sweetness, which suits American palates better. Mintia tends to reflect basic Japanese cuisine's flavors. Japanese people like things less sweet, more sour, and more bitter because they're used to it. Jaded palates like mine like these things a lot because they're bored. That being said, I like Mintia because the flavors are usually pretty intense. Every tiny little sugar-free pellet of this "rich grapefruit" flavor is sour without making your mouth pucker and sweet enough for balance. It evens tastes like "real" grapefruit to a fair extent, though without any of the intense bitterness of the real deal. The first ingredient is "grapefruit sugar" followed by a scary cocktail of sweeteners that the likes of me does not mind but those that are sensitive to them may want to avoid. The packaging tells us that there are some sort of grapefruit chips in them as well as some sort of "grapefruit aroma" addition. They do smell good, though I doubt many people other than myself will be sniffing at them. You are, after all, normal rather than a bizarre junk foodie. 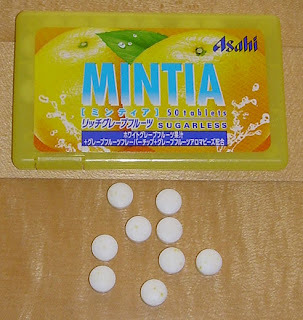 My only "problem" with Mintia, and I've never had a bad experience with them, is that I tend to want to eat a whole package at once. At 24 calories per 50 teeny tiny pellets, this isn't much of an expense calorically, and at around 100-120 yen ($1.23-$1.47) per pack, it's not hard on the wallet. It is, however, hard on the tongue as these are closer to the rough texture of a pressed powdered candy than the slick smoothness of a Tic-Tac and tend to be abrasive on your sensitive body parts. I'd definitely buy these again, but I'd have to wait until after my tongue has healed. 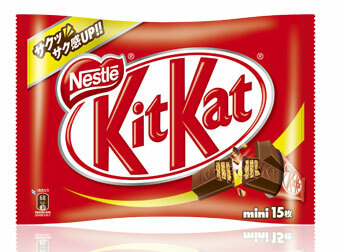 Image pilfered from the Nestle Japan web site. As my very first product information post, I'm pleased to show you something which Nestle Japan was boring me with just before I left Japan. I actually feel a little guilty putting it that way because proceeds from the sales of this release are for charity. Twenty yen (about 25 cents) from each bag of 13 mini KitKats sold will go to help rebuild the Sanriku railway which was badly damaged in the Tohoku earthquake last March. The theme of "world" relates to recognizing all of the messages of support that Japan got from all over the world in the aftermath of the disaster. Each bag retails for 500 yen (525 with tax/$6.46). Nestle Japan doesn't tell you how long it will be available, but it was released on March 5, so I imagine it won't be too hard to find in the coming months. The reason that I didn't buy this when it popped up in Japan is that it is essentially a bag of various milk chocolate KitKats. 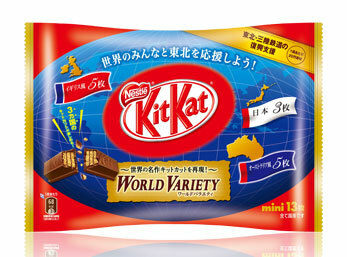 There are 5 each of the British and Australian versions of KitKats and 3 of the Japanese ones. Thirteen seems like an odd (and unlucky, if you are superstitious) number of bars to offer. It seems a bit chintzy not to just give 5 Japan bars and make it 15, but there it is. I'm sure there are subtle taste variations between every version of a milk chocolate KitKat world-wide, but the notion of sampling such minor differences didn't wow me into buying a bag. Minis never represent the best value for KitKats anyway, so I have to be heavily enticed by the flavor to buy them when they're not on a steep discount sale. That being said, if you want to be charitable, there are worse ways to get your generosity on. 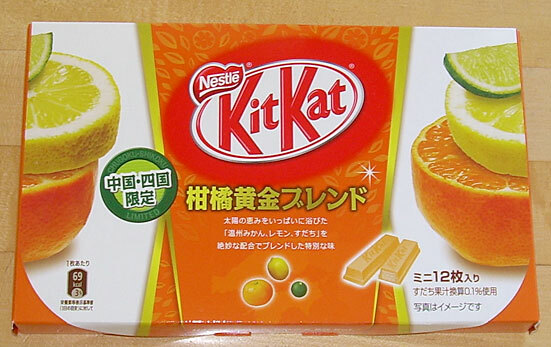 Image also pilfered from Nestle Japan. As a related aside, Nestle Japan has announced that it has changed the basic KitKat for the first time in 37 years by making the wafers crispier. It was common in Japan to see the words "saku saku uppu! (crispier)" on man, so it seems that the Japanese market loves nothing more than brittler forms of its favorite snack treats. I'm sure that researchers in various food labs all over Japan are furrowing their brows in concentration trying to wring a few more molecules of moisture out of their processed treats. This is the current availability of Japanese snacks at my present location, and what a sad lot it is! When I left Japan, there were a lot of question marks about the future of this blog. I knew that I wanted to continue, but I wasn't sure in what capacity I could. One thing is for certain and that is that I can't post about the same types of snacks that I did when I actually resided in Tokyo. If that sounds like a lament, it's not. In fact, it's actually a good thing from my perspective. The truth is that, after years of buying snacks, I was starting to feel fairly bored by a lot of what was on offer. Yes, there was the occasional rather extreme weirdness which was a stand-out like the twice-a-year odd Pepsi or Coke and the very rare strange KitKat which was actually "strange" and not just typical for Japan and therefore more curious to outsiders. While I would have never ran out of things to review, there was absolutely starting to be a real sense of "sameness" in what I could get my hands on, particularly as the seasonal repeats kept getting trotted out again and again. 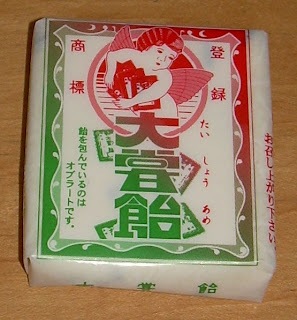 I could only review so many wasabi sembei, green tea sweets, or kinako candies before it felt old hat. My hat was looking pretty beat up by the time I left. If you want to know how boring it can get, check out the Onion's AV Club's occasional review of Japanese snacks. 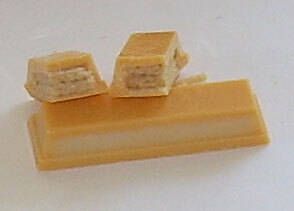 The "European Cheese" KitKat that I reviewed in November 2010 showed up on their rotation on March 26, 2012. That's a bit past the sell-by date. ;-) They don't even really want them. They just review what J-Box sends them for free because it's there. Their enthusiasm is so weak that they wait months (or years) to review limited edition items such that they are no longer available by the time the reviews appear. And these people have far less to be jaded about than I do as these are actual novelties to them. That is not to say that I no longer have an interest in Japanese snacks. That would be very far from the truth, but after awhile, having full access starts to mean less and less. I'm still interested in such snacks, but I don't think that only those things which can be had in Japan are of value for me to try. 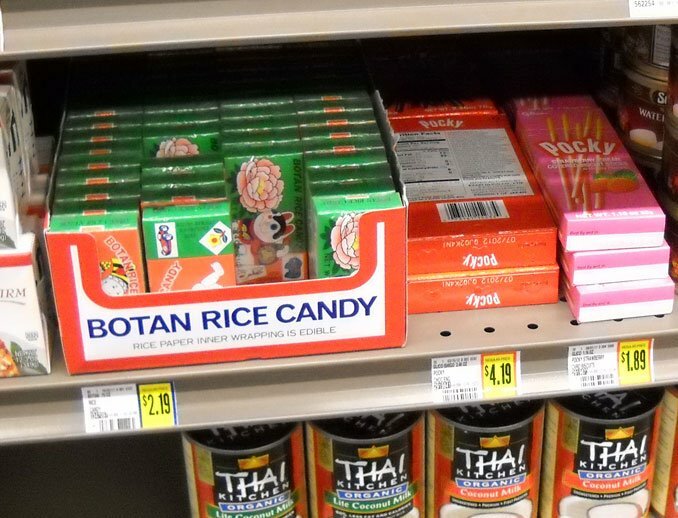 There are Japanese-style (and imported) items in America to be tried and comparisons to be made about the difference between what is offered in each country. Years of eating everything (and nearly anything) have given me a perspective that I could never have acquired otherwise. As one of my kind commenters suggested, there is also the potential for me to approach American snacks from the perspective of someone who hasn't had them for a long time and is well-acclimated to a different taste and presentation. The truth is that this idea was already on my mind because things are definitely not as expected on that front. Another point is that one thing which consistently nagged at me as I went about my business of snacking and reviewing was the way in which dumb people were occasionally writing to me and asking me to sell them snacks (as they thought I sold what I reviewed for reasons that mystify me) and lovely people with much better reading comprehension skills who were interested in the snacks I wrote about asked me how they might acquire such rarities. From where I was, I was in no position to know how one could get such things from outside of Japan. From where I am now (which is somewhere in the San Juan Islands), I can only access what everyone else can through the same means that they have. So, the state of the blog is that things will have to change, but I hope to largely maintain the focus on Japanese food, and snacks in particular. I still have a backlog of reviews of things I had in Japan as well as a stash of things that I brought with me. The reviews of uniquely Japanese things that can be bought only in Japan aren't drying up (and are unlikely to go away entirely for various reasons, least of which that I still have connections in Japan). Eventually though, my stash will be tapped out, but that's okay. Part of what I did was eat the food and talk about how it tasted, but I also simply let people know what was out there and what it was all about. That is something I can continue to do through product release information. I will be incorporating posts which talk about what is out in Japan, even if I personally can't buy such items. Frankly speaking, I don't know that this is incredibly different for my readers, particularly when they couldn't acquire those items anyway. If it sounds interesting and you're going to Japan, it doesn't matter if I put it in my mouth and told you if I liked it because each person's sense of taste is different. It mainly matters that you know enough to look for it and have some idea of where to find it. Right now, my access to everything, and I mean everything, including all sorts of American products, is limited by my location. I also do not have a permanent address and will be a nomad until around October. That means that I can't really set up a connection with importers without switching addresses 4 times in less than 6 months. Eventually, I will make such connections, and I will definitely gain better access to stores with imports, but, for now, I'm going to have to go with what I have. I hope my readers will bear with me as this blog finds a new footing. I'm looking forward to the new challenge and focus. Thanks for reading. Every time a restaurant in America tries to grab attention with some sort of gargantuan portion which clearly no individual (or even a small party) is meant to eat, it ends up being an example of American portions being out of control. In Japan, such over-size offerings are seen for what they are, a joke. Well, they might also be a bit of a challenge for more gluttonous sorts, but I doubt few would opt for the types of carbo-overkill offered at this restaurant near Kagurazaka station. As for what they are offering, you could buy 2.5 kg/5.5 lbs. of fried rice (cha-han) for 5840 yen ($72), 100 pot stickers (gyoza) for 9600 yen ($117), 3.2 kg/7 lbs. 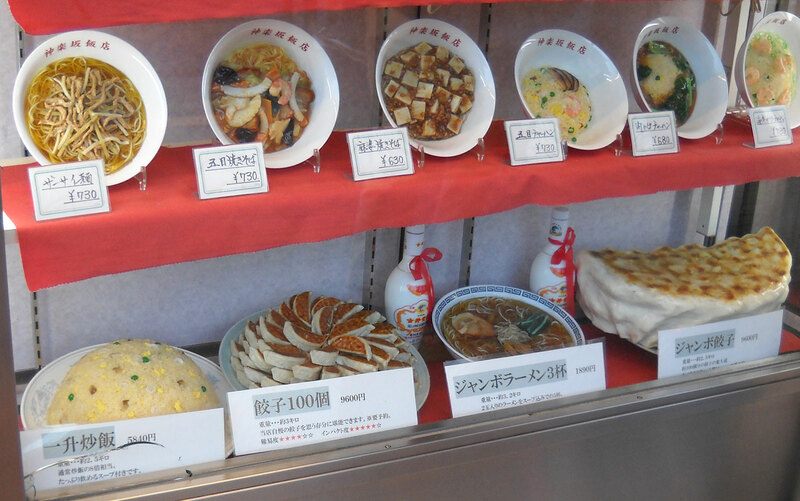 of ramen for the bargain price of 1890 yen ($23) or an enormous pot sticker (2.3 kg./5 lbs.) for 9600 yen ($117). I'm guessing the ramen was the big seller in the crowd given it's reasonable price. When I visited Kamakura, home of the big Buddha, I saw loads of people walking around with shopping bags with the design on the front of the Hato Sable (pigeon/dove cookies). I didn't understand why they were so popular, and I wasn't planning on finding out at that time. I was in Kamakura, for Pete's sake! I was going to try something traditional food, not what looked like a Western-style butter cookie! Of course, my dedication to all things Japanese on a trip to the land of the giant Buddha would have seemed a bit less hypocritical if my husband and I hadn't gone to an authentic German restaurant by the sea ran by two authentic German people (the food was great, incidentally). 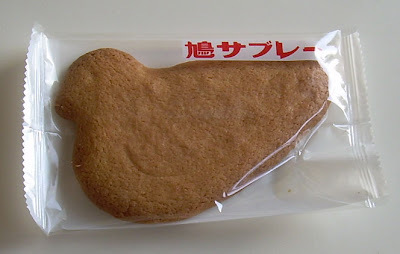 The web site for these cookies says that the hato sable was "born" in Kamakura, so I guess that is why they were sold in abundance there. However, you can get them at many outlets around Tokyo as well as order them online from the company's web site. 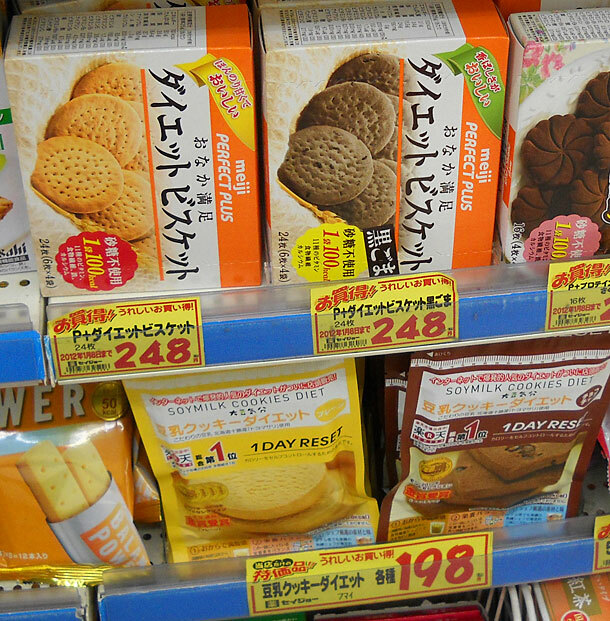 A box of 10 large cookies is 1050 yen (about $13). When I say "large", I mean that these cookies wouldn't be out of place in an American bakery. They're jumbo by Japanese standards, but then I guess miniature pigeons wouldn't really do now, would they? "Sable" means "sandy" and it is used in French to mean a cookie crispy, sugary, tender, and maybe even a little salty. These were introduced in the Meiji era in Japan when European culture was being welcomed with open arms by the Emperor. The ingredients list is very simple: flour, sugar, butter, eggs, and baking powder. There is nothing surprising in there, but the result is a perfectly crispy cookie with a rich buttery flavor and an amazing texture. They are neither too sweet nor too bland and have a very fine sense that separates them from commercially available butter cookies such as those that are sold in shelf stable packaging in markets. I've been told that these cookies are extremely popular in Japan (especially as of the time I'm writing this). I'm not sure why after so many years of making them that they should be more popular now than ever. Maybe it's marketing and ramping up their distribution such that they are more readily available outside of Kamakura. Perhaps it's more complicated than that and people crave something simple yet high quality that carries a sense of richness in times of prolonged hard times. All I can say is that these are very well-made cookies that are not terribly expensive. 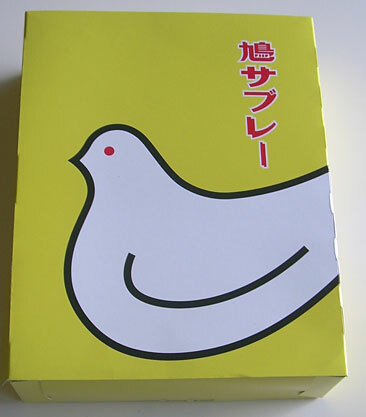 If you see the distinctive bird design on the sunny yellow box, buy them and enjoy one with a cup of tea or coffee. Unless you're the type of person who needs heaping helpings of sugar in your sweets, there's every chance you're going to really appreciate these. I've always been curious about the origin of various foods and wary of the notion that any food was solely invented by one particular culture. Long-time and attentive readers will recall that I question the notions of “Japanese bread” and “Japanese cheesecake” as these are not Japanese at all, but minor variations on European cuisine (as are many other baked food items). All of that being said, I think there are some things which make sense as food concepts which likely were "discovered" simultaneously in various cultures. Pancakes would fall into the category of things that you could easily see being created all over the world without input from other cultures. How imaginative does a person have to be to think about adding (any type of) flour to liquid and then deciding to pour into onto a hot, oiled surface? 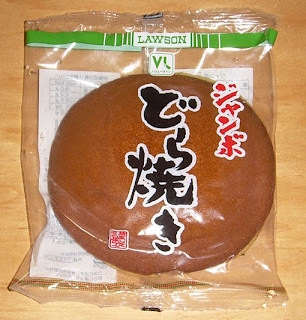 Dorayaki is something which I haven't reviewed before because it is most often sold filled with chunky sweet red bean paste (tsubuan) and I'm more of a fan of koshian (finer paste that has had the skins sifted out and has more of a smooth fudge-like texture). As time has gone by, I've grown a lot mellower about coarser versions and as our departure from Japan approached, I became more and more attracted to traditional Japanese sweets including those with chunky-style sweet red beans. It's important to say at this point that I didn't go 23 years in Japan having never eaten dorayaki. It's a very common treat and I'd been exposed to it before, but didn't really pay much attention to it when I ate it. My first really positive experience with it came at a Japanese all-you-can-eat buffet that had a dessert bar which included some damn fine dorayaki. This 100 yen ($1.22) super large (about the diameter of my open hand with splayed fingers) “jumbo dorayaki” wasn't something that I expected to live up to that aforementioned red-bean-filled pancake, but it certainly was more accessible since it was on sale at the local Lawson 100 shop a few minutes from our apartment. 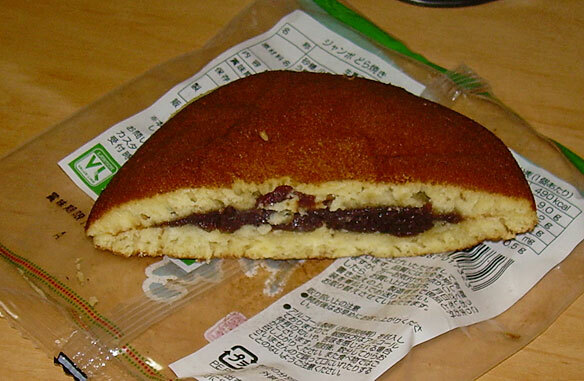 Dorayaki is basically two pancakes sandwiching some sort of filling, usually bean paste. The main question is not what it will taste like, but what the textures will be like. Will the cake be sticky and weird on the outside (sometimes they are), dry (ditto), or tough (double ditto)? Will the beans be too sweet or too bland? In the the case of this dorayaki, the pancake had a very nice flavor and texture and was only slightly tacky on the outside. It was tender and appropriately sweet for a relatively bland wrapper for the bean filling. The beans themselves were quite sweet and lacked a strong “beany” taste. I could have done with a bit more flavor depth on that front, but I can't say it was terribly disappointing and I felt that it was sweet and had a satisfyingly dense texture. I can't say this is the best dorayaki ever, but I can say that the value for the size and price is on the amazing side. It is quite tasty and I'd definitely buy it again if I had the chance. It's important to note that this really is a "whole lotta dorayaki" at 490 calories for the entire thing. A quarter makes a serviceable snack, half makes for a nice continental breakfast, and the whole thing for an enjoyable pig-out. You can guess which I went for. Click to see a bigger picture. I'm not sure what the soymilk cookies are supposed to reset in one day (appetite? ), but I have my doubts about their ability to suppress appetite. I think my brain goes in patterns and I'm not even aware of it. 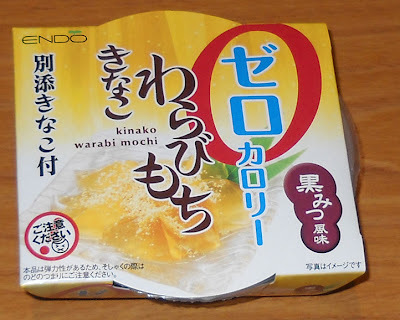 On Monday, I reviewed diet warabi mochi gelatin and the random picture that I chose (which wasn't even from the same set of photos, I assure you) is of diet cookies. I guess all of the junk food I'm seeing in the U.S. and the potential temptation has made my unconscious calorie conscious. One of the things I remember my mother buying when I was a kid was a box of "diet" candy called Ayds. Setting aside the product name which would now remind people of a terrible disease, this product always seemed to me like a bad concept. The idea with Ayds, as it is with these diet cookies (which are rampant in Japan), is that you eat candy, cookies or bars instead of meals. While they may be packed with chemically distilled vital nutrients, I can't imagine that they fill the space in your stomach very effectively. I should note that, in addition to the plethora of these types of cookies made my Japanese manufacturers, there was also a big push for a much more expensive French-made diet cookie in many stores. Still, Japanese people seem to be far better at "enduring" (gaman) hardship and deal with these meal substitution plans better than my mom did. The Ayds never helped her lose weight, after all. I lived on a big island (that'd be Japan for those who are incredibly dim or haven't been reading this blog for awhile) for 23 years and am currently taking my ease on a much, much smaller island and will be here for the next 6 weeks or so. These two (groups of) islands have very little in common and I'm dealing with some heavy duty reverse culture shock right now. The only thing they seem to have in common are higher prices than mainland America. In Japan, prices are higher because, well, it's Japan. The island I'm on now has higher prices because all goods must be brought in by ferry and there's an added cost. One of the things that people do three times a week here is offer a chance to give away or take free items that are no longer of use. There are huge stacks of second-hand clothes, a few very clean-looking toilets, dishes, etc. I guess that, in a place on which there are few shops and it's hard to bring in new things, people are attentive to making the most of what crosses the water and makes it onto this particular island. It strikes me that this "take it or leave it" approach to used goods would never be popular back in Japan, especially not in Tokyo. One reason for this is that Japanese folks tend to be squeamish about second-hand stuff. I often asked students if they would take something for nothing in various circumstances and they overwhelmingly said "no". For instance, I asked if they'd pick up a gorgeous pair of boots in the right size that were left at the side of the street with a sign that said "free". Even if I said they were guaranteed clean, they'd say they wouldn't take them. I also used to do a lesson in which people would answer a question about whether or not they'd like to win the lottery and get a lot of money and they also say "no" because money had no meaning if they didn't work for it. I don't know if people were being honest with themselves about not taking something for nothing, but the answer was given often enough for me to believe there is a strong cultural underpinning which says that it's always best to pay for what you get in sweat or cash. Certainly, the relative dearth of zero calorie foods in Japan often made me think that people felt that every ounce of pleasure had to be balanced with an ounce of potential body fat. Now that I'm back in the U.S., I can see all too well that the desire to get something (sweet food) and pay nothing (calorie-free) is much more strongly reflected in the options available in stores. Shortly before I left Japan, I found this gelatin at a Lawson convenience store (228 yen/$2.77) and jumped on it for two reasons. First of all, I am American and would prefer not to pay for my pleasure, at least not in increased fat cells. 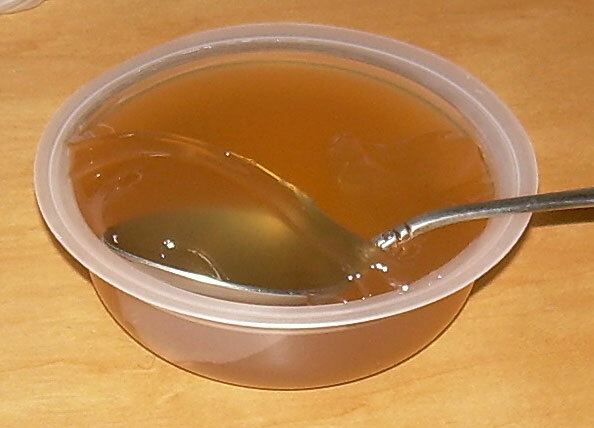 Certainly, I paid a fair bit in cash for a single serving (about a cup)of calorie-free gelatin dessert. Warabi mochi, incidentally, is a traditional Japanese dessert which consists of gelatin-like soft blobs with little flavor themselves that are served with toasted soybean flour (kinako) and molasses honey (brown/black sugar syrup). The real deal is addictively delicious and chock full of sugar. The chance to have my warabi mochi without the sugar was too good to pass up. Of course, the Japanese are right about having to pay for things in order to have them be worthwhile. There was no way a zero calorie gelatin dessert was going to live up to the real deal, but hope does spring eternal. There were two major problems with this and the first was that the texture was nowhere near the gentle, soft blobs of delight of warabi mochi. It was like weird stretchy gelatin dessert. Imagine trying to spoon some Jell-O to your mouth and having it fight by by resisting. The second problem was that this was super sweet with an unpleasantly intense brown sugar flavor. To me, it seemed like eating brown sugar out of the bag with a spoon. 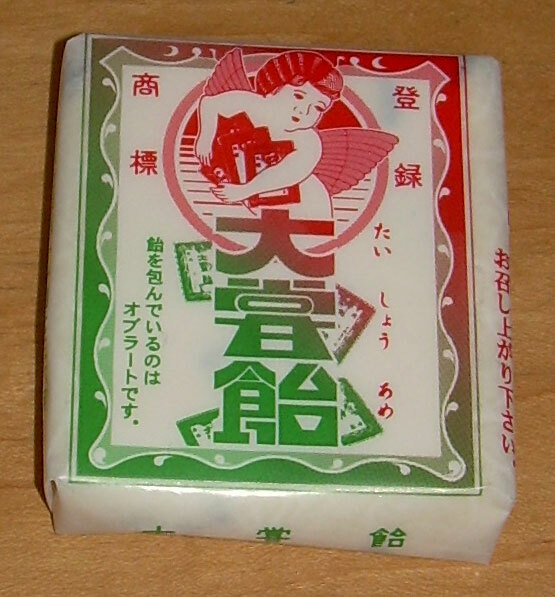 The nutty soy notes of kinako were entirely absent, despite the name of the product. This wasn't exactly the most vile thing I've ever eaten, but it wasn't great. I've actually consumed plenty of Japanese zero calorie gelatin desserts and they were all pretty similar to what I can get in America save the fact that many had nata de coco in them (which I loved). This was different and therefore a more interesting experience, but not necessarily a better one. If something involves a lot of fat, there is a good chance that the French are doing it quite well, and if you know that the "cro" in "Choco Cro" means croissant, you'll know why I'm invoking the French. Sometimes, it means that the Japanese can do it even better and I've been told that is the case with these pain au chocolat. Since I've never been to France, however, I'll have to take the word of other people who type about their impressions in various blogs and forums. I'm sure they're just as great authorities on this matter as the likes of me. One thing that both the French and the Japanese have is a fearlessness when it comes to fat consumption. You can order grilled chicken skin (no chicken, just the skin) in yakitori-ya (grilled meat on sticks joints). 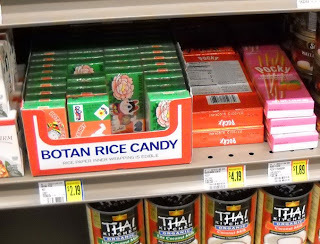 I also learned from long experience that the candy often has a higher fat content and that is what makes it so rich and decadent compared to American chocolate. Americans jumped on a low-fat and non-fat bandwagon at some point in the 80's and have been suffering because of it ever since. They subbed sugar and chemicals for all of the fat they cut out, and lost texture and flavor. When it comes to "Choco Cro", a chain of cafes that sells tiny little croissants stuffed with rich fillings, "fat" is definitely where it's at. From the buttery pastry to the rich, creamy fillings, these are a lipid party for your body and every fat cell is invited. For the time being, Choco Cro is selling a special "strawberry daifuku" version. It is meant to emulate the Japanese sweet which is composed of mochi (rice cake), red beans, and a real fresh strawberry. I've had the real deal and, while it can be very good if it is super fresh, it can also be a little weird if the berries have been inside for more than a day. Strawberries don't age well in the best of circumstances. When they are surrounded by a heavy wad of sweet red bean paste, they do even less well. If you look at the picture above, you will see there are three fillings piped into the top one. One is the "mochi", the next is chocolate, and the last is strawberry. If there is actual sweet bean paste in there, it didn't really shine through in the flavor since my husband liked this and he hates anko. Mostly, I thought it had a pleasantly strong strawberry flavor coupled with a good chocolate taste and a weird textural element from the "mochi". I didn't hate this, but I wouldn't choose to get it again. The tiramisu (center one) incorporated a cream cheese filling along with chocolate and the most marginal hint of coffee. The cream cheese is supposed to sub for the mascarpone and I thought it was delicious, but my husband didn't care for it at all. Again, that has to do with his general lack of affinity for cream cheese. 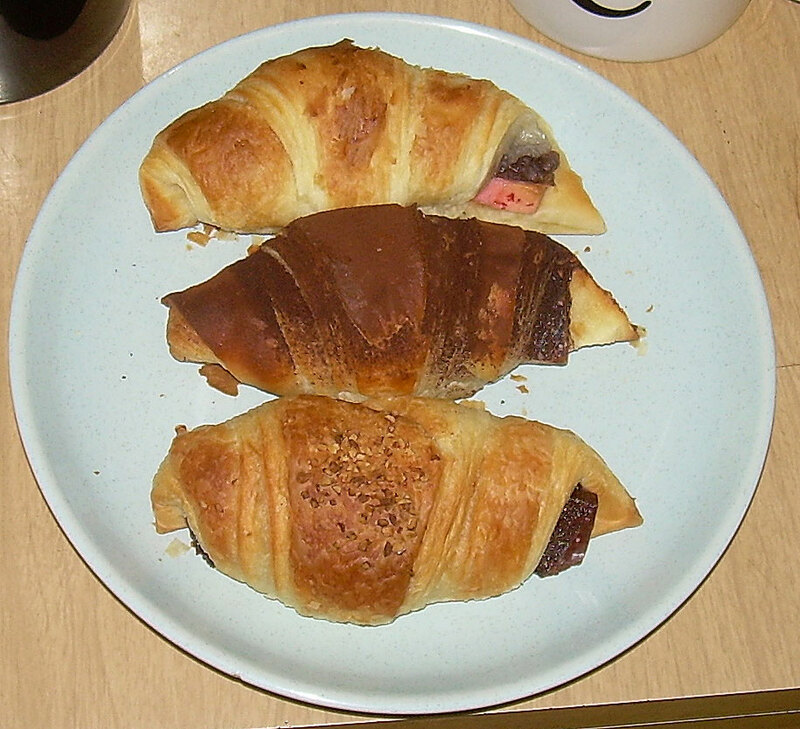 Like all Choco Cro croissants, the pastry was flaky, light, and had the perfect combination of crispy and moist dough. It's buttery and very satisfying both in terms of the texture and taste. The fillings are very much something the taster will respond to subjectively and I loved the tiramisu and my husband enjoyed the strawberry daifuku. Of course, we both remain great fans of the classic chocolate "choco cro". If you're in Japan and have a chance, a visit to "Choco Cro" is a must. You will not be disappointed, even with the smallish portions at slightly high prices (about 250-300 yen per or around $3 each). The only thing I'd recommend for non-smokers is to get one "to go" because they have the most pathetic partition between smoking and non-smoking that I have ever experienced. My last full day in Japan was March 28 and my husband and I traveled to the place where it all started for us, Kita-senju. This was where I "met" him for the first time and lived in his apartment for a month in 1988. As part of our experience, I had my last taiyaki. For those who don't remember, taiyaki is a waffle/pancake like cake with a filling that is shaped like a fish. The most popular kinds are filled with sweetened beans or custard, though a wide variety of fillings can be had including savory ones. The shop we went to hadn't even started doing business when we arrived, though they were actually open. My order started the day for the proprietors and here we see him making his first batch of the day. The device he's holding is being used to fill the other half of the mold. The right half already contains kabocha (Japanese pumpkin) filling. 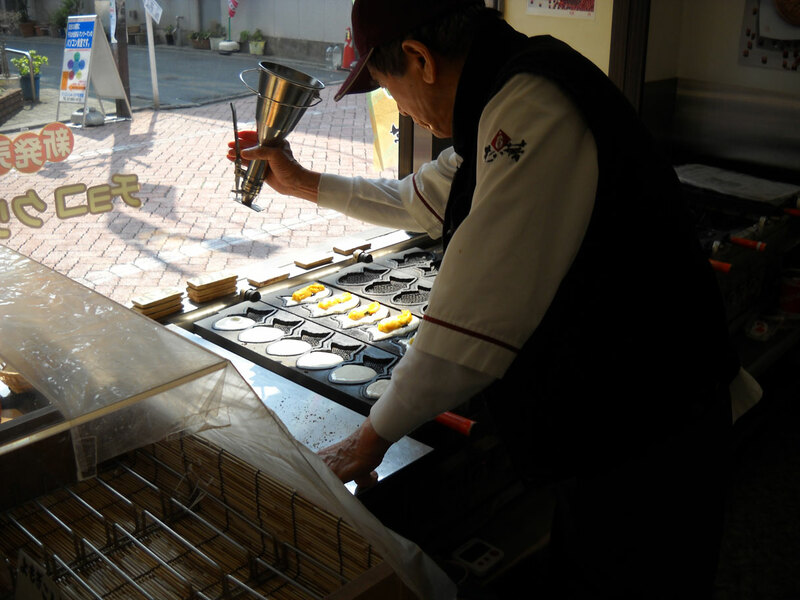 He made 5 pumpkin and 5 bean varieties at the same time even though I ordered just one kabocha. I guess the rest will be set aside for those who buy in bulk. One of my readers once said that it was hard to get really freshly made taiyaki as often patrons are sold pre-made ones. I was lucky because my very last experience was about as fresh as could be. I have whined before that I would not fork over 840 yen ($10.23) for boxes of region-specific KitKats. There is something about standing in an airport knowing that this is the last time I'll be there and have a chance to turn my nose up at these somewhat expensive candy bars that makes me put my nose back down and plunk down my yen. There are lots of regional KitKats around, and many had been for sale just down the street from where I used to work in Shinjuku. With the knowledge that I can no longer go down the street to buy such things in the forefront of my mind, I bought this and another box of regional KitKats for review. These KitKats represent the regions of Chugoku and Shikoku, both of which grow citrus fruit and I'm guessing that is pretty much where any regional connection is born and passes gracefully away. I say they "represent" because clearly they aren't only sold there if you can buy them at Narita International Airport. 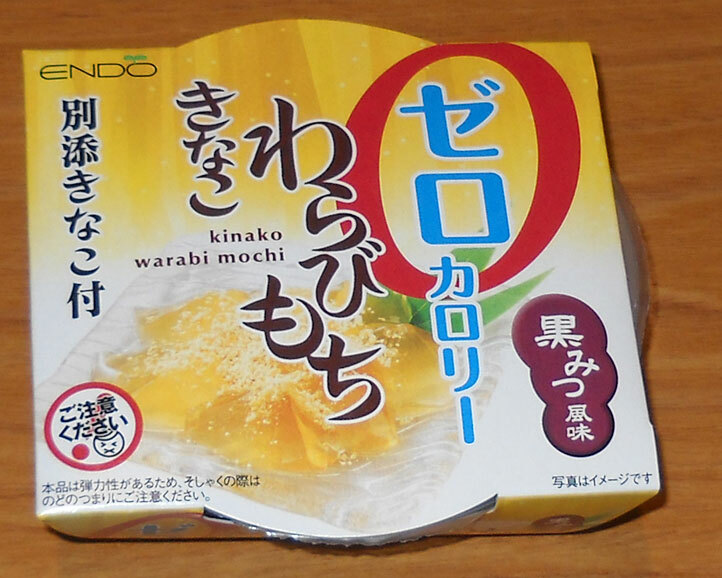 The fruit blend is sudachi, mikan (a Japanese tangerine), and lemon. I have seen sudachi before, but thought it was a lime. It's supposed to be zestier than lemons and limes, and I'm pretty sure that I've had it in various Japanese dishes. The bar smells like a mixture of lemon, orange, and white chocolate. The first burst of flavor is definitely a pretty nice juicy orange task followed by a very mellow lemon. I only ate one small bar (as that would be one serving size), and thought it was pretty good. With any white chocolate candy, I'm mainly hoping that the sweetness doesn't overwhelm and it isn't too cloying. Getting depth of flavor rather than some one-note overbearing taste, is a bonus, and I'm pleased to say that this has that going for it as well. There are 12 mini bars in one box and each is 69 calories. Breaking down the price, each bar is 70 yen (85 cents), which is not a ridiculous price, but still more expensive than buying regular 4-finger boxes of specialty or regular KitKats. However, this is a pretty tasty variation and worth at least one sampling, especially if you are a fan of citrus white chocolate candy. It may not be the requisite "weird Japanese KitKat" flavor, but at least it's good.